Since then, he has scored and assisted a countless number of times, but more importantly has been the face and influence of Sydney FC on a number of occasions and in big games. He is a guy who is always relied on, yet never fails to impress. He may not have scored as many goals as the likes of Adrian Mierzejewski, Filip Holosko or other midfielders, but what’s important is that he has always been there for Sydney when he was needed. He has raised the profile of the club its self dramatically and has managed to win a few trophies while doing so. Milos Ninkovic has always, even if not evident, been the star of the team. Last year, when Adrian Mierzejewski was having the season of his life, instead of getting angry and deciding to sook about it and try to do everything he’s doing, he changed his playing style. He became a deep playmaker, cutting inside and then playing a through ball or a simple pass to another teammate, who could then take the glory. He may have not registered many assists or goals, but the number of plays he started or indirect assists he got was staggering, and the sad part for him was only the people that watched him very closely understood how much of an influence he had in their season. I have always really liked Ninkovic, not only for his playing style and ability but for his class on and off the field, as there aren’t many players that would, after having a season that he had, make way for a new import that took over his spotlight. The season before was the complete opposite for Ninkovic. If there was someone who made headlines, it was him. After every game, the newspapers were full of reports about him, and it wasn’t as if it was unearned. Every game, he was making a massive contribution to the team, whether it was scoring, assisting or making a fantastic dribble, everything seemed to be about him. He was putting the whole league on another level, and he got the reward for it by the end of the season. He managed to secure the double, winning the A-League Premiers Plate and the A-League itself. The grand final, in a way, represented Milos Ninkovic’s season. He started the game off strongly, but Victory wasn’t giving him any space to work with. Luckily for Sydney, his game was making space out of nothing, but every time he got out of a tight gap, he was automatically fouled. It’s actually a miracle that Carl Valeri didn’t get a red card, as he committed an astonishing number of fouls against Ninkovic. It was a frustrating game for Ninkovic, but justice was served after Danny Vukovic made an amazing save, which gave Ninkovic the chance to win the league for Sydney. In this previous week, he had won the Johnny Warren medal for best player in the league, so the stage was set. For him, there was only one option: to score. He may not be the best penalty taker, but his calmness prevailed and he slotted his penalty home. Adrenaline took over as he went to celebrate with the cove. He had won Sydney the title! When Ninkovic leaves Sydney, a lot will change. First of all, they probably won’t have two attacking midfielders. It is normal in not just the A-League, but every league around the world to only have one attacking midfielder, which means that you can still have pacey and tricky wingers. In the past few years, Sydney has sacrificed having not much pace but lots of creativity in the team, so the first thing they will do is sort out that balance. Even though they have lacked pace, Sydney still managed to do amazingly without actual wingers, but it is likely that they will try to sort that problem out. Also, their style of play will change. They used to get the ball deep, and then a player like Ninkovic would bring the ball up, but in future (which is actually what has started to happen now), they will just clear the ball and have a pacey striker feed off scraps. Right now, Sydney is starting to adjust, as half the time Adam Le Fondre will feed off scraps, and half the time Ninkovic or Siem De Jong would carry the ball up before playing it. It is likely, however, that Sydney will start getting defensive midfielders to carry the ball up and play it to a pacey winger, as we saw in the FFA Cup semi-final when Buhagiar was playing. Although Sydney is already starting to change their style, they will want to hold on to Ninkovic right until his retirement. 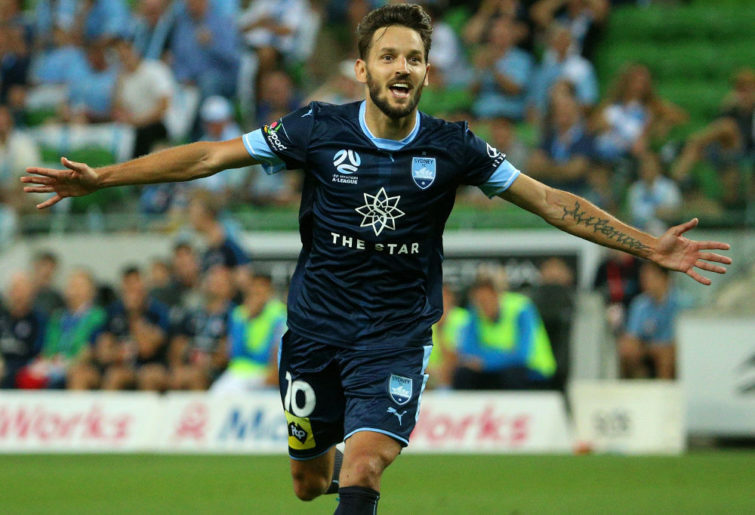 Overall, Ninkovic has been an amazing addition to the Sydney FC team ever since he joined in 2015. I will not argue that he has been the best marquee signing ever in the A-League, as I’m too young to have seen the likes of Del Piero and Archie Thompson, but there is no doubt that he is up there with the top players. That is shown by how Sydney changed their whole style when he was here, allowing the creativity to come from the left instead of the middle. There is no doubt that Ninkovic’s class will still be admired for years to come, and with his amazing tactical understanding for the game, I wouldn’t be surprised to see him become part of Sydney’s coaching team in the years to come.